Did you receive your economic stimulus check yet? These companies are offering you something extra if you will spend those bonuses with them. SUPERVALU, nationwide chain of 2,500 grocery stores. The deal: For every $300 gift card purchase purchased with a stimulus check, Supervalu will add an additional $30. Staples, nationwide office supply chain. The deal: $150 off $1,000 of furniture: $40 off purchase of $300 or more (except computers). 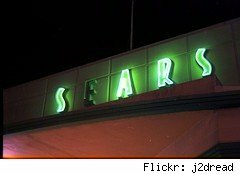 Sears, KMart and Land's End, retailers of fashion and home goods. The deal: Convert your check to a Sears, K-Mart, or Land's End gift card and they'll give you another gift card worth 10% of that value. For those receiving a full $600, that's a free $60. The catch: The offer begins May 14th and expires 7/18/08, and is only good for in-store purchases. Home Depot, retailer of construction and home supplies. The deal: discounts on environmentally-friendly items. Wal-Mart, the world's largest retailer of home, fashion and food products. The deal: Will cash checks free, no purchase required. Sam's Club, Wal-Mart's bulk sales membership-required retailer. The deal: Free membership for non-members or a $40 gift card for existing members with purchase of selected items. Free cashing of the stimulus check. Lowe's, retailer of construction and home supplies. The deal: Will cash checks for free, no purchase required. Meijer, retailer of home goods, clothes, and groceries. RadioShack, nationwide vendor of electronics. The deal: 10% off purchases over $50, with the balance of the check put on a Mastercard gift card. The catch: Valid May 4- July 12, 2008. The deal: $30 bonus on every $300 purchase of store gift cards. The catch: May 2 through July 31, 2008. Shop 'N Save, Cub Foods, Albertsons, Acme, Farm Fresh, Jewel-Osco, groceries owned by SuperValu Co., grocers. The deal: For loyalty club members, $5 off a $30 purchase. The deal: shoppers that cash their check at Safeway will receive a coupon good for 10% off groceries purchased within two days. The catch: Good May 14- July 19th. Menards, construction and home supplies, in the Midwest. The deal: 5% bonus tacked onto store credit when you cash your check at Menards.